The Dutchware Chameleon (foreground, right), under a Winter Dream tarp by UGQ at Apache Lake, Arizona. Jan. 17, 2017—Dutch sent me a pre-production prototype of his new Chameleon hammock, which is being funded through Kickstarter. The Dutchware Chameleon is a modular hammock that starts with an open hammock with the addition of a zip-off bug net, winter cover, and other accessories. What really makes the Chameleon stand apart from other modular hammocks is the proprietary fabrics, suspension system, and the reversible zipper that is toothed rather than coiled that allows the bug net and winter cover to be completely removed and flipped so you can change the direction of the lay from left/right to right/left as desired. This means that a single hammock design can suit the needs of most without requiring a special order. High-quality finish work and sewing. The cinched end points use a standard continuous loop and ridgeline design. Most modular hammocks are also termed “4-season” hammocks because of the addition of the winter cover that can trap air and create a warmer microclimate close to the occupant. The different covers are sold separately. The hammock body comes standard with multiple clips and tie-out points to further accessorize and customize the hammock. Removable side pull-outs can be adjusted at the attachment point or re-located as needed. 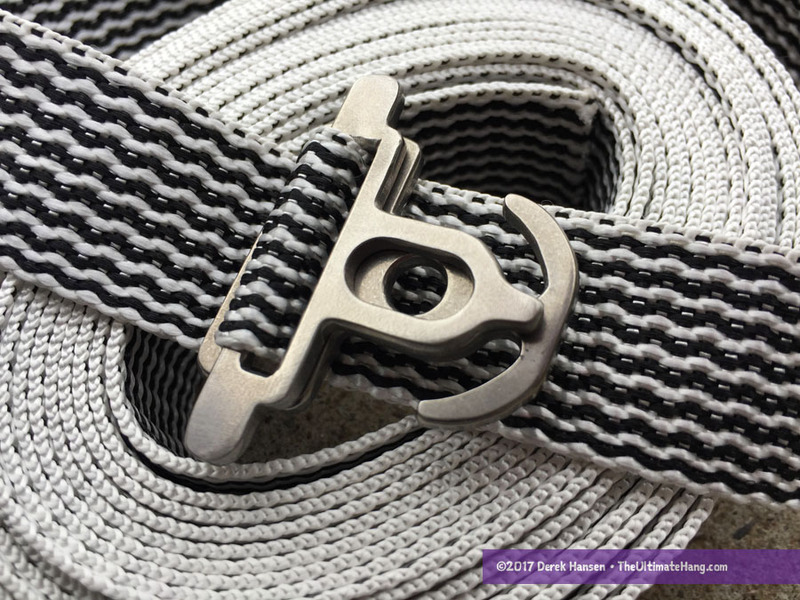 Over the past few years, Dutchware has developed a few new fabrics that are favorites in the hammock community for their superior feel, weight, and strength. 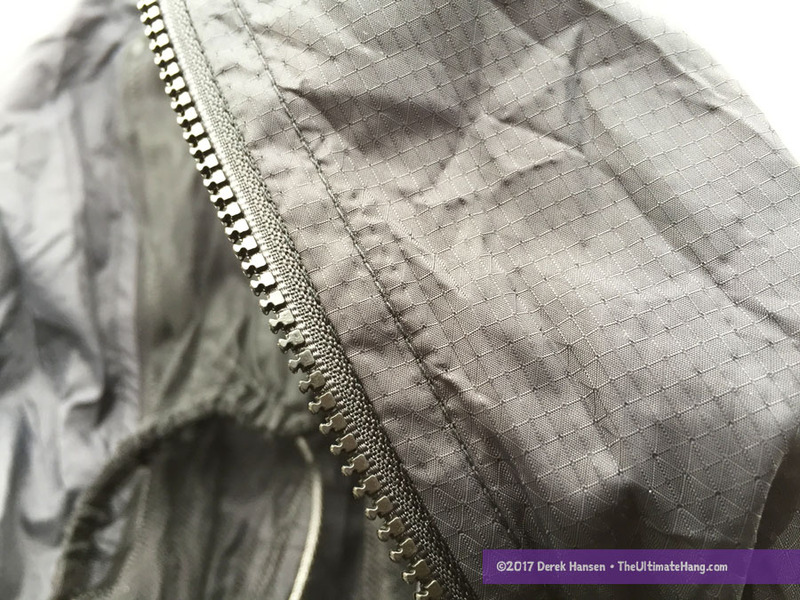 The 15 denier ARGON fabric, known for its breathability and durable water-resistant treatment is used for the winter cover. 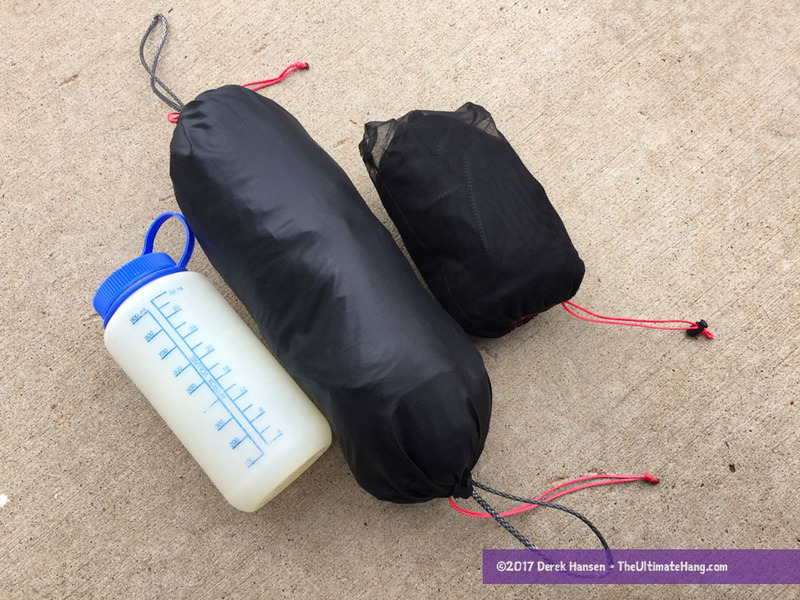 The 1.0, 1.6, or 2.4 oz Hexon fabric is used for the hammock body, which features a six-way ripstop grid. The Chameleon is also being bundled with a new “Beetle” suspension, also developed by Dutchware. 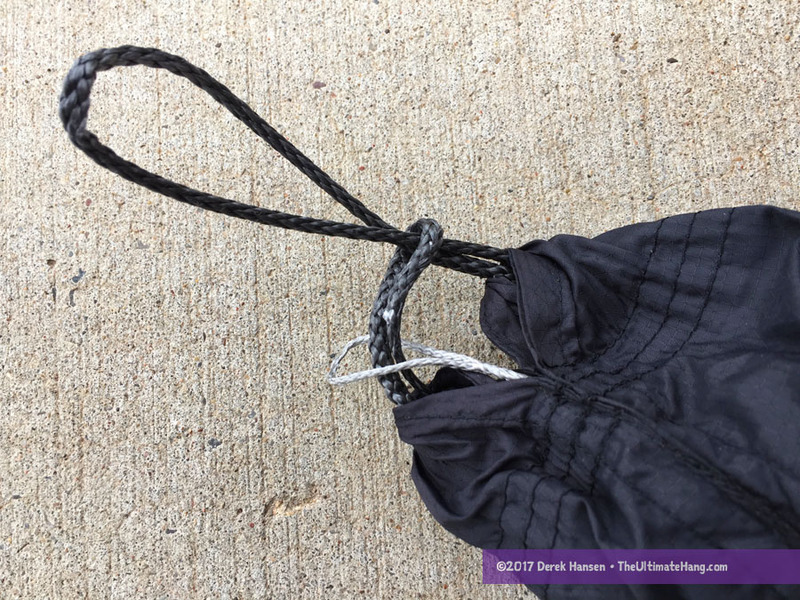 It is similar to a tri-glide and cinch buckles with a quick-adjust pull tab and a hole to receive a spreader bar so two such equipped hammocks can hang side-by-side from the same anchor point. My first reaction when setting up the Chameleon was how well it was made. The construction really blew me away, especially comparing it to the first-gen version of the Dutchware Half-wit hammock I reviewed. Dutch is well-known for making quality hammock accessories, but creating complex jungle hammocks is not something I considered his forte, until now. The finish work and stitching rivals that of other cottage vendors, who are well-known for the highest-quality construction. It’s this attention to detail that really separates those who mass-produce and those who are true artisans. Cottage vendors typically sweat the details: tight seams; straight, even stitching; no loose threads; refined tapers; and well-considered accessories, just to name a few. The Chameleon I tested has a nice finished look both inside and out. Clearly, whomever Dutch has leading his sewing crew is doing an amazing job. My next reaction in inspecting the Chameleon was noticing similarities between other hammocks, such as the Dream Hammock Sparrow and Raven. These hammocks also have reversible and removable bug netting and feature many of the same accessories and finishing touches, including the signature end caps that have distinguished Dream Hammock for years. These similarities have struck a cord with many who argue the Chameleon is simply a Dream Hammock clone or knock-off. 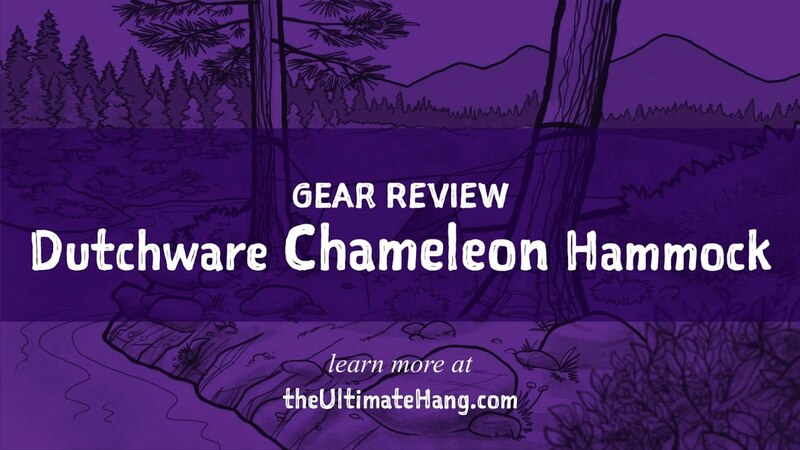 Yes, there are similarities between the Chameleon and many other hammocks including Warbonnet Outdoors, Hennessy Hammock, and Dream Hammock. Crossover? Yes. Clone? Not exactly. Innovation and original thinking is often a new way of organizing other ideas, combining, changing, and adapting existing material. Folks also get upset about hammock patents, but this is one way to protect these ideas, although it is prohibitively expensive and time consuming both to submit and defend. 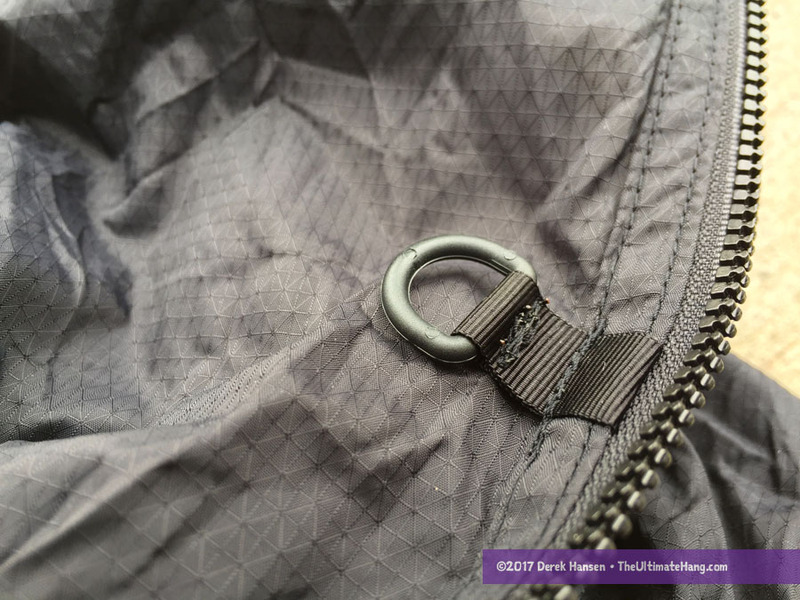 In the outdoor industry, often what differentiates products are the little details: proprietary fabrics, custom-made accessories, innovative approaches, and customer service. 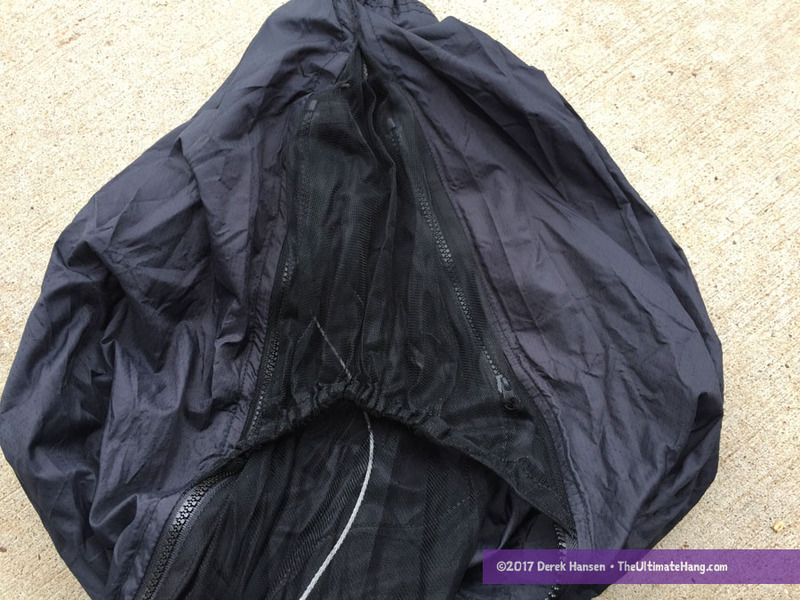 From the outside, it can be difficult to tell the difference between products such as down jackets from the top five clothing manufacturers. And as soon as one company uses the latest [insert fad here] many follow suit. It’s this type of leap-frog “innovation” that accelerates improvements in design, fabrics, and accessories and keeps competition strong, along with keeping up with customer demands. For years, the only commercial jungle hammock was from Hennessy Hammock and those designs stayed relatively static for years until Warbonnet and others adapted those designs and made incremental changes, sometimes prompting lawsuits, but eventually a new product emerged. Now, even Hennessy has adapted their tried-and-true designs to provide zipper enclosures (I’ve even seen prototypes with Whoopie Slings and trapezoidal foot boxes!). While I don’t want to discourage folks from cheering on their favorite brands, it is clear that most hammock designs out there adapt or imitate features from one another. There are often unique elements that become signature calling cards to a brand, such as the Warbonnet “footbox” and gear shelf, or the extreme personalization of Dream Hammock. Dutchware uses their proprietary Hexon and Argon fabrics and hardware accessories. The Chameleon is Dutchware’s entrance into a very crowded space with established players. However, I believe that this hammock is on par with the competition and provides another option for those looking for high-quality, high-end fabrics, accessories, and modularity in a jungle hammock. I first saw the Hexon and Argon fabrics in person at a group hang a few years ago. Everyone was raving about the feel and how light it was. The Hexon comes in a few weights and my Chameleon came in the 1.6 oz, which provided a little more rigidity (which I like) while still keeping fairly lightweight. The Argon is really light and works well as an over cover. 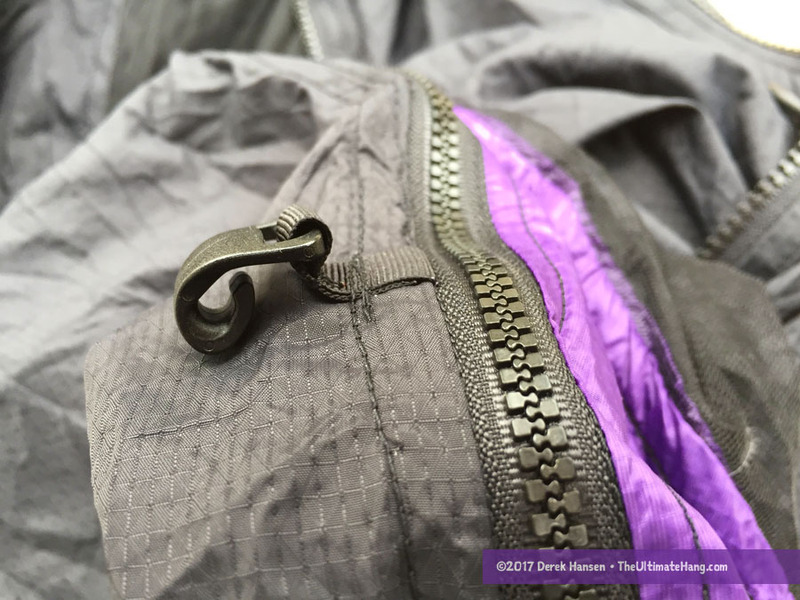 The Chameleon includes zippers on both sides of each cover (bug net and winter), each with two zipper pulls. This really makes it easy to remove and replace a cover and eliminates any sharp turns at the peaks. The hammock uses the same peak cover design as Dream Hammock, which while it does mean there is a small covered hole at the peak, I’ve yet to hear any complaints that the design fails to keep bugs out. I’ve tested a few modular hammocks that come with interchangeable covers. One valid concern is condensation. The Dutchware vent design cuts diagonally up to the ridgeline. The vent is always open. I like that the vent continues all the way to the top of the ridgeline so hot, moist air can travel naturally to the highest point (theoretically) before it condenses on the fabric. Ventilation can be problematic depending on conditions. My own limited experience has been good so far, but I need further testing to see what kind of condensation to expect as temperatures drop. Another differentiator between the Chameleon and other custom hammocks is the inclusion of all the tie-out and clip points as part of the base price. I will also add that I felt the Chameleon’s positioning is spot-on. The pull-outs aligned perfectly with my head and shoulder and feet, keeping the fabric and netting away and making the interior more roomy. The quilt clips are a nice feature for those who use under quilts as they help keep a 3/4 quilt in place, especially on the shoulder and foot areas. I think it is pretty cool that the covers can be flipped so the hammock can be reoriented. For the most part, the zipper slides well, but there were times when it felt a little rough when tracking. I’ll have to review the hammock a little longer to see if there are any performance issues, but for now it works okay. It’s nice to have zipper openings on both sides. This used to be a distinguishing feature of some Dream Hammock models, and it is nice to see it on other hammocks. On a recent kayaking trip, it was handy to be able to access the hammock from the opposite side when I was trying to access gear. The biggest thing missing on this hammock was internal storage. At the time of this writing, Dutch was going to provide storage bags as an add-on accessory. While I think that some storage options should be extra, it would be nice to have at least one pocket standard. There are plenty of attachment points where a bag can be clipped, including the ridgeline. While testing this hammock, I brought along a gear hammock that I slung to the side to keep my gear off the ground and close by. The suspension system consists of a long strap and a cinch-style hardware device. Dutch chose to release his much-anticipated hardware device, the Beetle, in connection with the Chameleon. 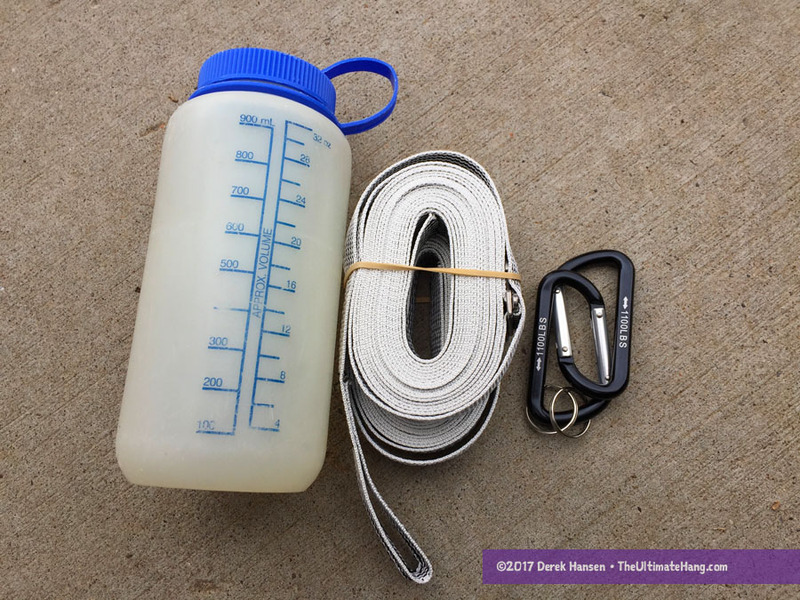 The strap set is long: 15 ft-long Dyneema/Polyester webbing, which is about 5 ft longer than most standard straps and probably 7 ft longer than most folks need. It’s a really nice strap by itself, but the hardware device makes it really useful and multi-purpose. The slider works well for quick tightening adjustments, and the pull tab allows for an easier release to relax the tension. I really like the connector hole that allows two hammocks to be strung side-by-side in a “V” formation but use the same anchor points. This makes it easier to share a tarp between two hangers. My main concern with the Beetle, which is true of all thin hardware devices, is abrasion. Most of Dutchware devices are cut from flat pieces of Titanium or Aluminum, which have hard corners for suspension to bend and wrap around. Dutch has improved the tooling over the years to reduce the edges, but as a safety measure, I recommend regular inspection of your suspension to check for wear and tear. 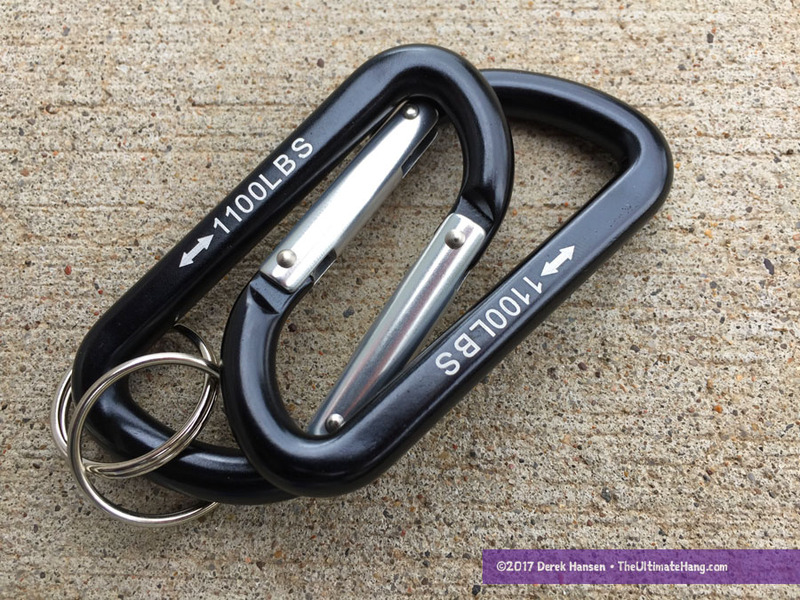 Included with the suspension were two lightweight carabiners that can be used as quick-connects around an anchor point. Aesthetics ♥ ♥ ♥ ♥ ♥ A few, but limited color options. Some customization is possible.